Model stitched on 14 Ct. Pink Aida with DMC floss. Stitch Count: 22x23. Use Mill Hill #42014 for nose and eyes or French knots using DMC 310. 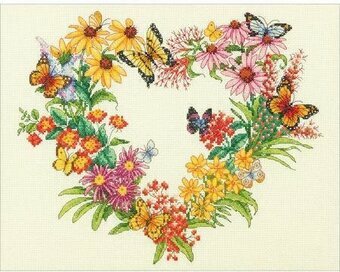 Cross stitch kit featuring a heart shaped wreath with flowers and butterflies. 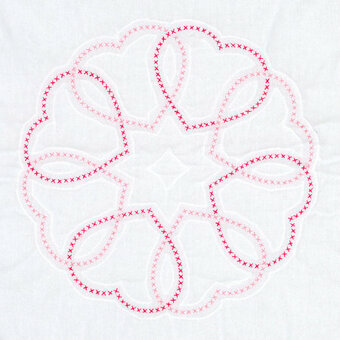 This kit contains 14-count ivory Aida, presorted thread, one needle and easy to follow instructions. Finished size: 11x14 inches. "Help! 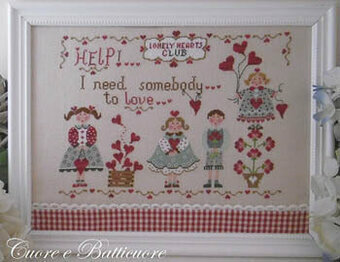 I need somebody to love..." Model stitched on 32 Ct. Antique Ivory Belfast using DMC floss. 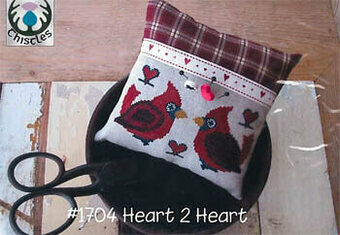 Stitch count 200x152. Model stitched on 32 Ct. Antique White Belfast linen with DMC floss, DMC Color Variations, DMC Diamant, and Mill Hill beads. Shown with 6mm mother of pearl flat sequins(need 5). Finishing instructions included. Model stitched over two threads on 32 count Dirty Belfast linen. Stitch count: 103W x 21H.DMC alternative: 938, 962, 224, 730, 522, 3781, 223, 712, 3688. 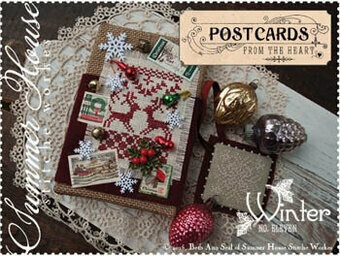 "Christmas opens our hearts to the joy & wonder of the season" Model stitched on 30 Ct. Confederate Gray usig Gentle Art Sampler Threads, Weeks Dye Works, Classic Colorworks, DMC floss and Kreinik braid (or all DMC 310, B5200, 3782, 814, 3371, 422, 3857, 433, 3051 ,414, 304, 3787, 3348 869, 3866). Stitch count is 173W x 111H. 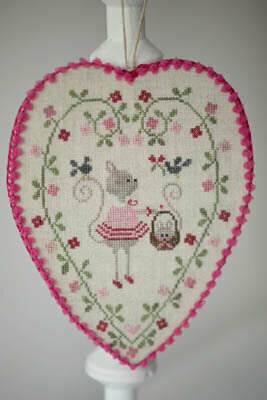 Model stitched on fabric of your choice with DMC floss, Mill Hill beads and Kreinik #4 Braid. Stitch Count: 234W x 276H. 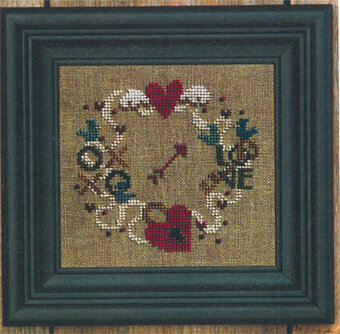 Model stitched on fabric of your choice with DMC floss, Mill Hill beads and Kreinik #4 Braid. Stitch Count: 183W x 256H. Model stitched on 28ct. Cobblestone Cashel Linen with DMC floss & Rainbow Gallery Treasure Braid. Stitch count is 197W X 233H. Part 1 of the 3 part Glad & Since Hearts series. 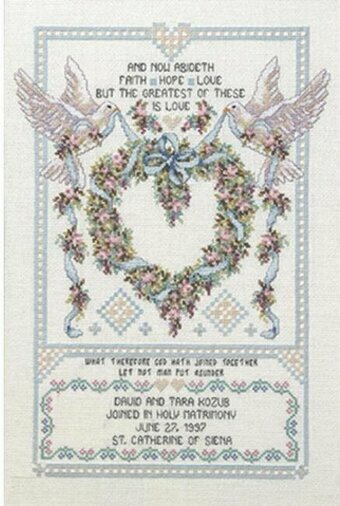 All 3 parts are required to complete the design as shown - "They broke bread in their homes and ate together with glad & since hearts." Series stitched over 2 threads on 28 ct. Lambswool linen with Classic Colorworks, Gentle Art Sampler threads and Week Dye Works floss (or DMC 712, 310, 224, 3032, 642, 356, 898, 832, 524, 930, 3011, 932, 3721, 221, 434, 3024, 611, 3052, 3031, 3072). Stitch Count: 178W x 42H.Comes with buttons. 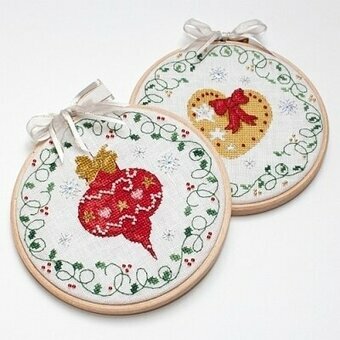 Stitch on fabric of your choice using DMC floss. Stitch count: 76W x 66H. Model stitched on 32 Count Cream Linen using DMC and Valdani floss. Other items needed but not included are matching cotton fabric for the back and optional 1 1/4" black ribbon. Stitch Count: 168 x 126. Model stitched on 14 Ct. Antique White Aida or 28 Ct. Antique White Lugana with Sullivan's Floss or DMC. Stitch Count: 123H x 94W. This package contains six screen printed 18x18 inch poly/cotton broadcloth quilt blocks, one needle, graph and instructions. Floss and quilt finishing items not included. Designer: Sandra Garbrandt. "Grace thy heart, grace thy mind with wisdom of the purest kind." Model stitched over two threads on 36 Ct. Vintage Buttercream using Weeks Dye Works & Gentle Art Sampler threads (or DMC 924, 370). Stitch count 167x105. Model stitched on 18 Ct. Sandstone Mono Canvas using Caron Collection Snow (#24Dark Gold-2skeins) Caron Watercolours, DMC #5 Perle Cotton and Rainbow Gallery Gold Rush WG1c Brass-2 Cards. 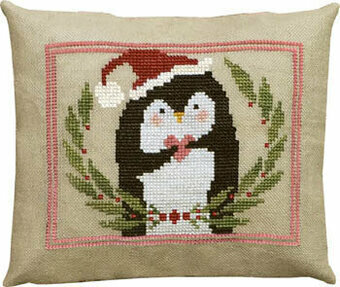 Stitch count 200x200. "England, Scotland, Wales, Ireland, Canada, Australia, New Zealand, Holland, Sweden, and Norway." 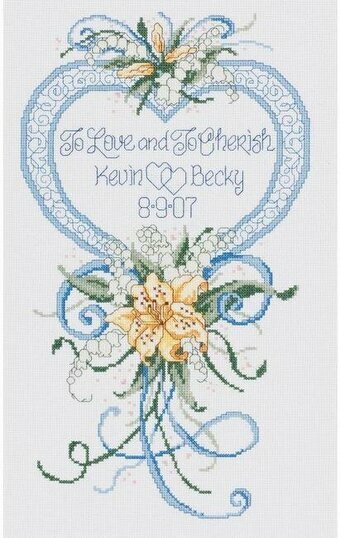 All models stitched on 25 count Antique White Lugana with Kreinik #4 Braid, and DMC floss. The stitch count for all of the models is 42H x 48W. The "England" pattern uses Kreinik #4 Braid #002 metallic gold, and DMC floss (310, 815, 304, 3328, 3706, 3362, 3364, 645, White, and 932). The "Scotland" pattern uses Kreinik # 4 Braid #002 metallic gold, and DMC floss (White, 310, 554, 553, 550, 3362, 3364, 645, 815, 930, and 754). The "Wales" pattern uses Kreinik #4 Braid #002 metallic gold, and DMC floss (3364, 3362, 743, 729, 3371, 645, 3772, White, and 3777). The "Ireland" pattern uses Kreinik #4 Braid #002 metallic gold and DMC floss (310, 754, 815, 3362, 3363, 3364, 645, and White). The "Canada" pattern uses Kreinik #4 Braid metallic gold and DMC floss (611, 645, 310, 3777, 3364, 3362, 729, White, 815, and 931). The "Australia" pattern uses Kreinik #4 Braid #002 metallic gold, DMC floss (3721, 645, 743, 3362, 3363, White, 310, 932, and 3364). 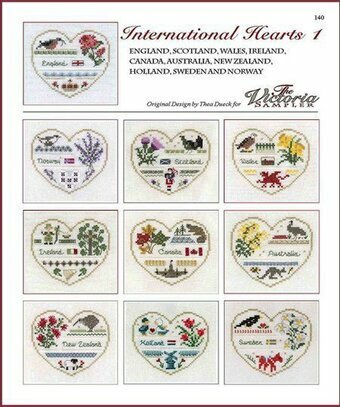 The "New Zealand" pattern uses Kreinik #4 Braid #002 metallic gold and DMC floss (762, 642, 645, 304, 3364, 3362, White, 3371, 931, and 318). The "Holland" pattern uses Kreinik #4 Braid #002 metallic gold and DMC floss (3706, 891, 304, 3364, 3362, White, 754, 932, 931, 930, and 676). 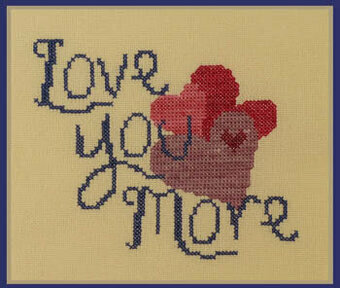 The "Sweden" pattern uses Kreinik #4 Braid #002 and DMC floss (White, 310, 347, 415, 793, 726, 742, 3362, and 3363). The "Norway" pattern uses Kreinik #4 Braid #002 metallic gold, DMC floss (White, 210, 304, 310, 340, 553, 645, and 3362), DMC Perle Cotton #8 White, and DMC Perle Cotton #12 White. Model stitched on 32 Ct. Busy Bee Blend linen by R&R Reproductions with Gentle Art Sampler threads (or DMC 648, 646,310, 221, 3011, 930, 3852, 831, White, 312, 3772, 3781). Stitch Count: 101W x 114H. 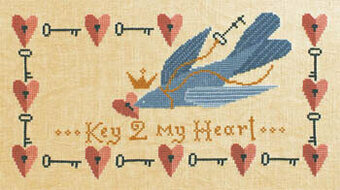 "Key 2 my heart." Model stitched over 2 threads on 30 Ct. Antique Cotton linen by R&R Reproductions with Sullivans floss (or DMC 3829, 930, 931, 932, 355, 356, 310). Stitch Count: 165x91. Model stitched over 2 threads on 36 Ct. Cream Edinburgh linen and 32 Ct. 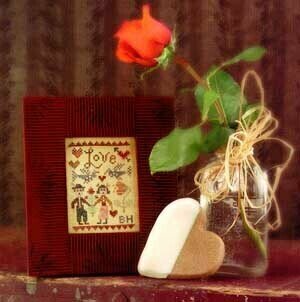 Beige Rose linen with DMC floss. Stitch Counts: 127x135 for the Red & Blue models and 127x118 for the White model. All models use DMC floss. Model stitched on 28 Ct Bone Lugana or Antique white Lugana using Gentle Art threads and DMC floss. Stitch count 71x60. Model stitched on 36 ct Antique White aged with coffee. Stitched using DMC floss. Stitch count 80x84. 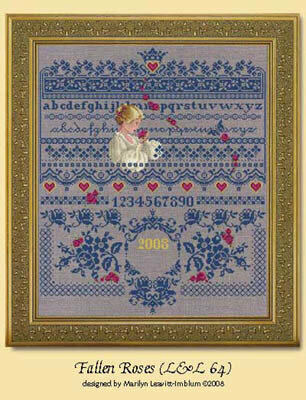 Fresh and fun Bucilla Counted Cross Stitch Kits are ideal for the beginning stitcher. Packaging shows completed project and provides simple-to-follow instructions with how-to illustrations. 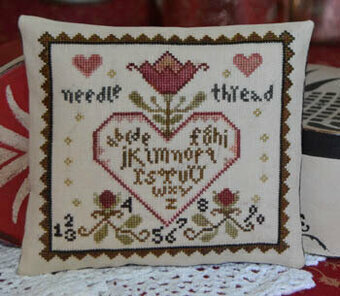 Kit includes 14 Ct. White Aida fabric, cotton floss, needle, 3" frame, and chart. Finished Size: 3" Round. Model stitched on 28 Ct. White Cashel linen with DMC floss and Kreinik #4 Braid. Stitch Count: 48W x 52H. Comes with an owl charm. Model stitched over two threads in 36 Ct. Regency linen from Picture This Plus with Needlepoint Inc Silks (or DMC 3777, 680, 3021, 3787, white, 310). 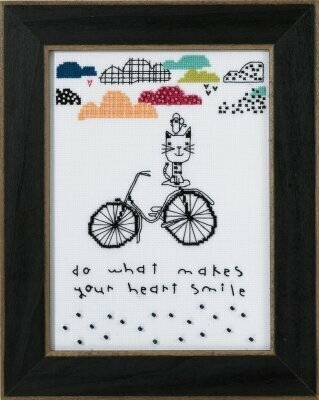 Stitch Count: 125W x 125H. 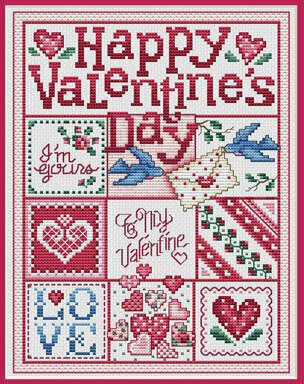 Model stitched over 2 threads on 30 ct. Liberty Gathering by R&R Reproductions with Gentle Art Sampler threads and Gentle Art Simply Wool(or DMC 3364, 3799, 356, 353, 347, ecru, 972, white). Stitch Count: 77x62. 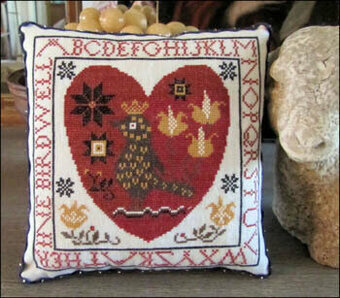 "Crow" is stitched on 30 Ct. Havana Linen by Weeks Dye Works with Gentle Arts Sampler threads (7098 - Black Licorice). Stitch Count: 25x30. "Leaf" is stitched on 40 Ct. Strawflower Linen by Lakeside Linens using Gloriana Tudor Silks (#77 Fall Foliage and #193 Copper). Stitch Count: 35x48. 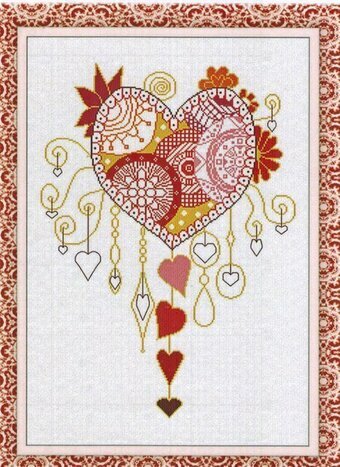 Feel free to use fabric and thread of your choice. 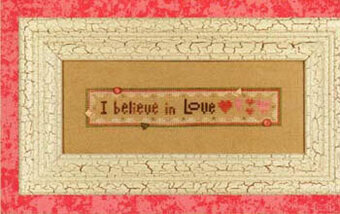 Design shown mounted on pre-finished 4"x6" burlap panels by Tim Holtz. 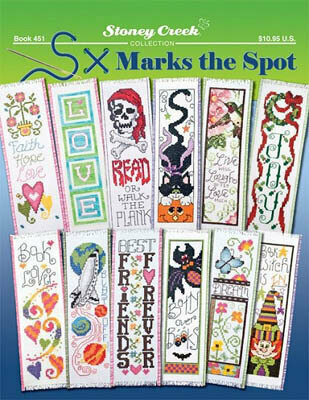 Personalize your postcard with stamps, lace, ribbon, buttons, charms, etc. Reindeer model is stitched on 28 Ct. Platinum Linen with Gentle Arts Sampler Threads. 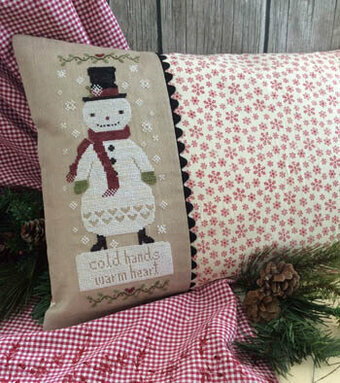 Snowflake model is stitched on 32 Ct. Tin Roof Linen by Weeks Dye Works with Gentle Arts Sampler Threads. Reindeer stitch count is 27x47. 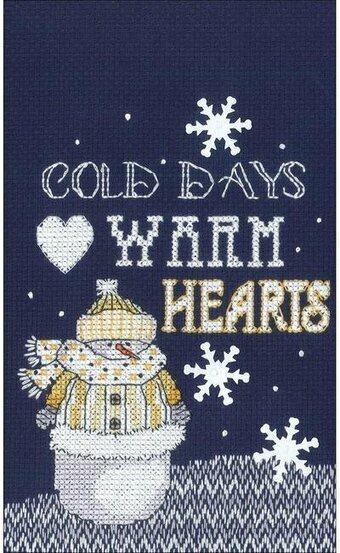 Snowflake stitch count is 25x25. Shown finished on Burlap Panels. 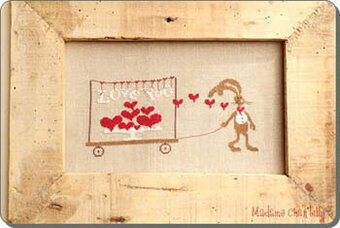 "Frame" is stitched on 32 Ct. Light Mocha linen using Gentle Art Sampler Threads. Stitch Count: 33x46. 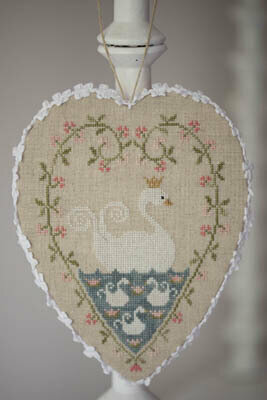 "Wings" is stitched on 32 Ct. Victorian Red lugana using Gentle Art Sampler Threads. Stitch Count: 35x12. 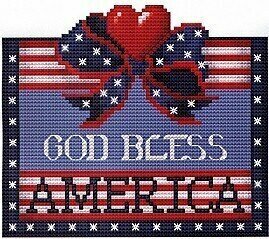 Feel free to use fabric and thread of your choice. 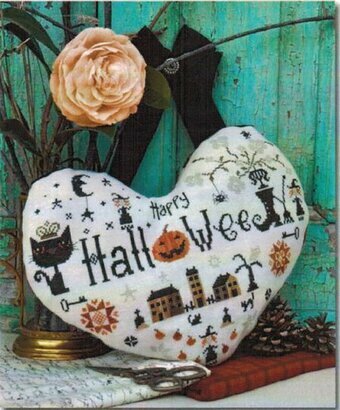 Design shown mounted on pre-finished 4"x6" burlap panels by Tim Holtz. 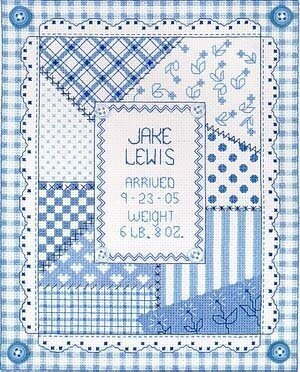 Personalize your postcard with stamps, lace, ribbon, buttons, charms, etc. Model stitched over two threads on 32 Ct. Lambswool linen using Classic Colorworks, Gentle Art Sampler threads and Weeks Dye Works floss (or DMc 3857, 3802, 3726, 3051, 3799, 310, 610, 3031, 869, 778). Stitch count 99x93.